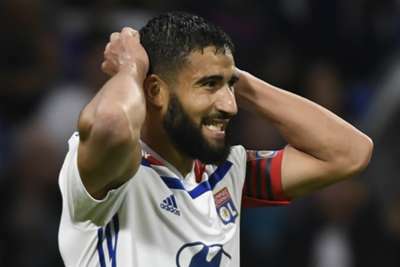 Inspirational skipper Nabil Fekir deflected praise to his "heroic" team-mates after leading Lyon to the Champions League knockout round on Wednesday. The France forward and long-time Liverpool target scored the crucial 65th-minute equaliser in a 1-1 draw at Shakhtar Donetsk that confirmed Lyon's progression alongside Group F winners Manchester City. His rifled finish from Memphis Depay's cutback cancelled out Junior Moraes' first-half opener in frosty Ukraine and proved enough to preserve the Ligue 1 outfit's two-point buffer in second. Bruno Genesio's men achieved qualification despite drawing each of their five games following the 2-1 upset of Manchester City at the Etihad Stadium in September. "We knew it wouldn't be easy here, especially with the snow. We persisted," Fekir told RMC Sport after the success against Shakhtar. "We conceded when we were playing well but we kept going. "Even if I scored the goal I think the whole team was heroic and showed up well. "We hadn't qualified for the last 16 for quite some time and now we'll wait for the draw. I hope we come up against a good club and play good games." Shakhtar were left to console themselves with third place in the group and a spot in the Europa League's last 32. Head coach Paulo Fonseca attributed the draw solely to Fekir's splendid strike. "Having scored a goal, we were in a better position, but we failed to protect the advantage," Fonseca said. "Of course, this also was a result of Fekir's individual qualities. He scored a brilliant goal. "I felt we could still win the game. We controlled Lyon very well, our strategy helped us to open the scoring, which was our aim. "But it all ended with a moment of genius from Fekir. It was a genius goal and now we are very upset because we understand that we were able to go through."